Due to our local farmer’s market skipping a week we were fortunate enough to have a surplus of one of my favorite fungi – the Lion’s Mane mushroom. I rarely get to indulge in this fantastic fungus, as it is one of the first things to sell out at the farmer’s market and it is in high demand by our local chefs that purchase from us. It’s popular for good reason – it has a very mild, almost seafood flavor that is reminiscent of backfin crab. It also has a host of health benefits, but I won’t cover that here. We also forage for Lion’s Mane, but it’s pretty rare. When we do find it in the wild it sometimes has some dirt and a few little friends (bugs) in it. We discovered that the best way to clean it is to hold it underwater and just wring it out like a sponge. Just like a sponge, it will snap back to its original shape, and all the dirt and critters get flushed out and replaced with the clean water. We decided that if it acts like a sponge with water, perhaps we can squeeze it in a bowl of some tasty liquid, and let it absorb that flavor? Sure enough, we have tried different broths (chicken, ham, seafood), and the little Lion’s Mane poms just soak up the flavor. This adds a ton of new options for what this versatile shroom can do in the kitchen! For this recipe I was in a seafood kind of mood so I used 1/2 lbs of East Coast shrimp (local shrimp is by far 1000 times superior in flavor than those farmed frozen imported things) and about 1 lbs of Lion’s Mane. The shrimp was optional, but we had it on hand so we figured we would throw it into the mix. I made about 2 cups of seafood stock using a pre-made stock mix (I like the Penzey’s brand), just enough to submerge the Lion’s Mane. Hold the Lion’s Mane under the broth and give it a good squeeze, then release. Repeat a couple of times, and you will end up with a much heavier pom, soaked in yummy seafood flavor. Let the poms sit for about 1/2 hour in the fridge as they integrate with the flavor of the broth. We then shredded the Lion’s Mane, boiled the shrimp for about 4-5 minutes, chopped them up, and mixed the two together. Then it’s just a matter of using this as a substitute for crab meat in your favorite hot crab dip recipe. 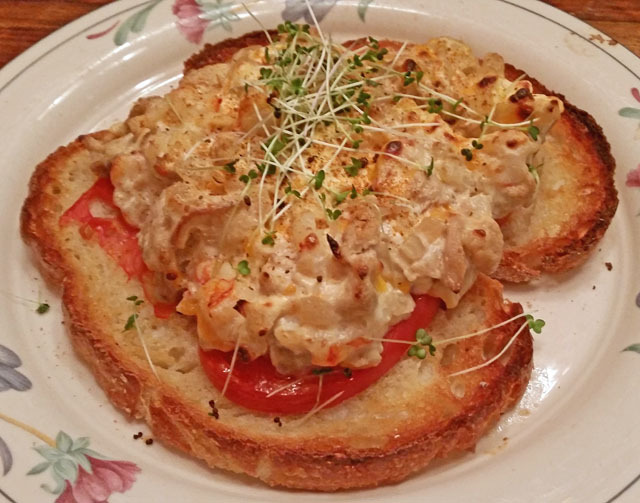 Toast some nice crunchy bread, put a couple of thin drained slices of tomato on them, then scoop some of the “crab” dip on top. Broil them for a few minutes and top with some spicy microgreens or arugula for garnish and texture, and serve!